An absorption image of a sonic black hole created in the lab. Image credit: Oren Lahav, et al. ©2010 The American Physical Society. (PhysOrg.com) -- Black holes get their name because they absorb all incoming light, and are so dense that none of that light can escape their event horizon. In a new study, scientists have created a sonic analogue of a black hole in the lab  that is, a sonic black hole in which sound waves rather than light waves are absorbed and cannot escape. The scientists hope that the short-lived sonic black hole could allow them to observe and study the elusive Hawking radiation that is predicted to be emitted by traditional black holes, which has so far been a very difficult task. The scientists, Oren Lahav and coauthors from the Technion-Israel Institute of Technology in Haifa, Israel, have published their study on the sonic black hole in a recent issue of Physical Review Letters. The researchers created the sonic black hole in a Bose-Einstein condensate made of 100,000 rubidium atoms slowed to their lowest quantum state in a magnetic trap. 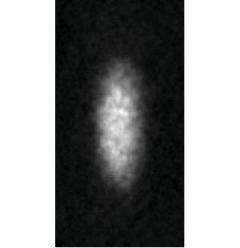 This cold cluster of atoms acts like a single, large quantum mechanical object. In order to transform this condensate into a sonic black hole, the scientists had to find a way to accelerate some of the condensate to supersonic speeds so that the condensate would contain some regions of supersonic flow and some regions of subsonic flow. The scientists achieved this acceleration by shining a large-diameter laser on the condensate in such a way as to create a steplike potential and a harmonic potential. When the condensate crosses the step in the steplike potential, the condensate accelerates to supersonic speeds. The scientists demonstrated that the condensate could accelerate to more than an order of magnitude faster than the speed of sound. In this setup, the step marks the boundary between the supersonic and subsonic regions, which acts as the black holes event horizon. At this event horizon, the flow velocity of the condensate is exactly equal to the speed of sound. On the supersonic side of the step, the density of the condensate is much lower than that on the subsonic side. As the scientists explained, the low density corresponds to a higher flow velocity due to conservation of mass. In their experiments, they could maintain the black hole event horizon for at least 20 milliseconds before it became unstable. Similar to how a black hole traps photons, the supersonic region of the sonic black hole can trap phonons and a wide range of other Bogoliubov excitations with a wavelength of between 1.6 and 18 micrometers. Excitations with very short wavelengths can escape, and those with longer wavelengths cannot fit in the supersonic region in the first place. In the future, the scientists plan to use the sonic black hole to study Hawking radiation. As the physicist Stephen Hawking first predicted, black holes may emit a small amount of thermal radiation due to quantum effects. Losing this radiation can cause black holes to shrink and eventually evaporate completely. But so far, detecting this radiation has been very challenging. In order to observe Hawking radiation in the case of the sonic black hole, there are a few requirements, such as that the trapped excitations must have negative energy. The researchers verified this in simulations: When focusing two laser beams with slightly different frequencies onto the supersonic region of the condensate, the simulated condensate absorbed a photon from one beam and emitted a photon into the second beam, creating an excitation with negative energy. In the future, the sonic black hole may give scientists a glimpse of Hawking radiation. I'm no scientist, but the following thought popped into my head as I read this. What if hydrogen atoms were substituted for the rubidium atoms as the basis of the Bose Einstein condensate, could such a sonic black hole trap of energy be used in the creation of a fusion reaction? Feel free to take your pot shot comments on my wacky idea. I feel like your comment has merit in the sense that yes, if we have such a fine level of control over hydrogen atoms/ions, then that would help fusion technology. A few problems with your proposal. I don't think anyone has successfully made a B-E condensate with hydrogen. It turns out that atoms must have certain properties to be readily condensed, which is why they're usually made with rubidium. I don't think hydrogen has the required properties. Second, fusion occurs at millions of degrees, while a condensate forms near absolute zero. I don't think it's possible to have both situations simultaneously. Is this analogous to an alcubierre metric 'warp bubble' rather than a black hole? If not, they should make that. Now that would be cool. Actually they have already observed B-E Condensates using hydrogen (probably isotopic). The idea about fusion is interesting, BUT the way that many atoms appear to become one atom is quite similar to fusion already without the release of energy which is what makes these condensates so interesting, I foresee some kind of electrolysis of a condensate under nanoscale confinement which would instantly change the pressure and temp of that condensate and possibly create a net energy gain if we can create the nanoscale architecture for a device to do it. There's a good explanation on wikipedia (Bose Einstein Condensate, "current research") which types of atoms can (relatively easily) form B-E condensates. that would be a great alt name for Thermodynamic, but I can see it's not you. Gravity can bend sound too. While I do see what you're getting at, the article says that certain wavelengths go straight through and others are too big, so if they study the right sized waves, they can "observe" "Hawking radiation". They won't really be observing it obviously, since there's no actual black hole. I think it still holds a decent analogy. If they see it, it would lend much credence to Hawking. It wouldn't verify it one way or the other, but it would add evidence. If they found there was nothing like Hawking radiation it would make lots wonder how far we should be going with the LHC. Luckily for me Hawking radiation makes sense, so I say go for it CERN. There would be no need to trap hydrogen when you start a fusion reaction because the gravity created by a series of fusion reactions (a mini star) will induce other hydrogen atoms to join the party. The trick is to stop too many hydrogen atoms from crashing the party, otherwise you will end up with a mini-black hole. It's not trapping the hydrogen that's a problem, it's controlling how many hydrogen atoms are introduced to the fusion process in order to avoid an uncontrollable black hole.